Recent rains are bringing chum salmon into numerous streams on the Kitsap Peninsula, according to Jon Oleyar, biologist for the Suquamish Tribe. But more rains are needed to help the salmon reach the upper tributaries and fully seed the system, he added. Folks attending the Kitsap Salmon Tours this Saturday should be able to see fish in most locations on this year’s list. Read on for details. The fall chum themselves seem larger than average this year, Jon said, which means the streams need a little more water than usual for the fish to easily swim upstream. Salmon can move quickly upstream and become stranded in too-shallow water after a downpour followed by a dry period, he said. In a worst-case scenario, fish may die before spawning. Once the rains have saturated the soil, the risk of low flows is reduced, but as of today we’re not at that point yet. Heavy rains last Saturday brought many fish into the streams, he added, but streams levels have dropped somewhat since then. The salmon are running at just the right time for the annual Kitsap Salmon Tours, which have been expanded this year with new locations and more volunteers to explain this wonder of nature and celebrate the arrival of salmon. Chico Salmon Viewing Park, Chico Way at Golf Club Hill Road: You will find informational booths and experts to help locate and describe the behaviors of the salmon. Wheelchair accessible during Saturday’s event. Keta Legacy Foundation Rhododendron Preserve, 2401 Seabeck Highway: Guided tours will take visitors through old-growth trees to the salmon stream. Experts will talk about the life cycle of salmon and their habitats. The 1.5-mile round trip involves going through some rough terrain. After the tour, warm up with refreshments in the historic Kitsap Cabin. Salmon Haven at Dickerson Creek, Northlake Way and Taylor Road, Bremerton: Restored stream channel at the fork where Dickerson Creek flows into Chico Creek. Site includes a picnic shelter. For more information about the event, visit the website for Kitsap Salmon Tours. With rain in the forecast, participants going to this year’s salmon tours should be prepared with raingear and sturdy shoes for walking through damp areas. 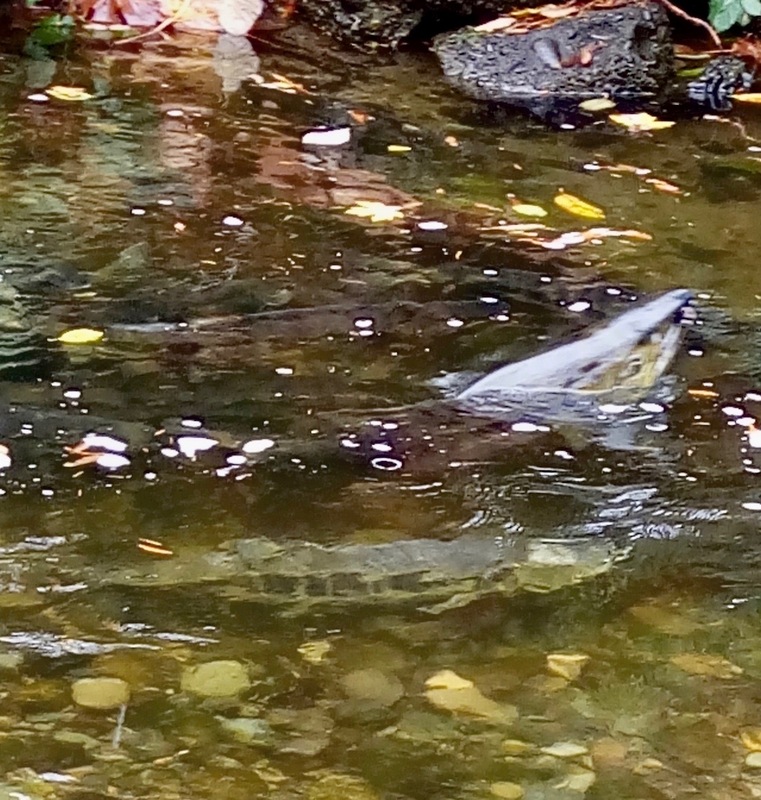 Chum salmon in Chico Creek. The best bet for seeing salmon on your outing is always Chico Salmon Viewing Park on Chico Way, where Chico Creek meanders through the park. Chico Creek remains the most productive chum salmon stream on the Kitsap Peninsula. Other good options include Dickerson Creek and Rhododendron Preserve upstream from the park and Kittyhawk Drive (Chico Creek mouth) downstream. 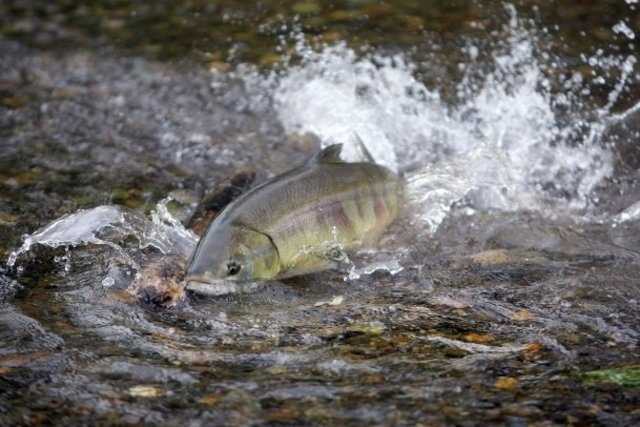 A few chum as well as some coho have begun to move up into Jarstad Park near Gorst following a sizable run of Chinook to the nearby salmon-rearing facility. In general, the peak of the chum run in Chico Creek comes around Thanksgiving, and one can return to the Chico Salmon Viewing Park throughout the fall. Blackjack Creek, which runs through Port Orchard, contains an early run of chum that is a bit late this year, Jon tells me. Gorst Creek and other streams in Sinclair Inlet contain later runs of chum, generally making for good viewing right up until Christmas and sometimes later. For other locations to view salmon, check out the Kitsap Sun’s salmon-viewing map, which still provides some good information for the Kitsap area. Click on the fish shown on the map for details about a particular site. It wasn’t until taking a tour in middle school – much like the Kitsap Salmon Tour – that I understood how vital a resource like salmon could be to a tribe of people. For many tribes in the Pacific Northwest, salmon function as both an ecological and cultural keystone species. Indigenous people couldn’t just run down to a local grocery store to pick up dinner; instead, they had to rely on the limited resources in their environment to survive. As a result, readily available food sources were highly prized and became integral parts of societal life. In the Northwest, anadromous fish like salmon often became interwoven into the cultural experience of many tribes and played vital roles in folklore, myth and legend, ritualistic experiences, and tribal identity. The great reverence that many indigenous people show towards animals and plants makes a lot of sense in light of that historical backdrop, and I think it’s great that groups like the Kitsap Salmon Tour help people experience that cultural lens.